What is RCM Virtual Data Rooms? RCM Virtual Data Rooms offers commercial real estate professionals, businesses, and individuals engaged in managing acquisitions, dispositions, asset portfolios, or the fundraising process a fast, easy, and secure option to share and store confidential information over the Internet. For almost two decades, RCM Virtual Data Rooms has helped commercial real estate owners, brokers, lenders, equity partners, asset managers, attorneys, and title companies to mention a few, reached and made successful deals. With RCM Virtual Data Rooms, users have the platform to share confidential documents within their organization and across their professional networks anytime and anywhere using any device. Bank-grade security guarantees the safety and security of all documents and their contents, encouraging users to share them with a great degree of confidence. 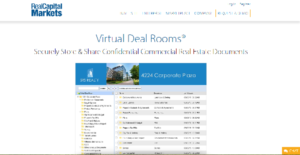 If you are a player in the commercial real estate market, then you know what RCM Virtual Data Rooms brings to the table. This secure and responsive virtual environment service by Real Capital Markets speeds up the due diligence process, which traditionally is littered with issues and can take much of your time. With RCM Virtual Data Rooms, securing, organizing, and sharing your documents while being able to adhere to strict compliance and due diligence regulations are attainable, giving you total control over the process. The platform allows for better organization and access management, which benefits you and other parties involved in your real estate transactions. Aside from due diligence becomes more accelerated and streamlined, RCM Virtual Data Rooms also provides you with a solution to securely store, share, and view your documents. Back when the ideas of VDRs were not yet conceived, real estate firms and professionals used physical rooms to stash their precious and crucial documents. To view the documents and all the data they contain, every party involved – firms, clients, and investors – needed to be physically present to ensure that everyone is on the same page as well as achieve transparency. RCM Virtual Data Rooms eliminates the need for having everyone physically present in the same room to view the data. Anyone with the right permissions can access and view the documents anytime and anywhere. This leads to faster decision making from both sides, better negotiation, and a smooth transaction. If you are interested in RCM Virtual Data Rooms it might also be beneficial to investigate other subcategories of Best Virtual Data Room Software listed in our base of SaaS software reviews. Since each company has particular business wants, it is sensible for them to refrain from searching for a one-size-fits-all perfect software application. Needless to say, it would be futile to try to find such a system even among market-leading software applications. The intelligent thing to do would be to catalog the various vital aspects that need consideration such as required features, finances, skill levels of employees, company size etc. Then, you should do your homework thoroughly. Read some RCM Virtual Data Rooms reviews and investigate each of the other solutions in your shortlist in detail. Such in-depth research can ensure you weed out ill-fitting platforms and zero in on the app that provides all the elements you require for business success. How Much Does RCM Virtual Data Rooms Cost? We realize that when you make a decision to buy Virtual Data Room Software it’s important not only to see how experts evaluate it in their reviews, but also to find out if the real people and companies that buy it are actually satisfied with the product. That’s why we’ve created our behavior-based Customer Satisfaction Algorithm™ that gathers customer reviews, comments and RCM Virtual Data Rooms reviews across a wide range of social media sites. The data is then presented in an easy to digest form showing how many people had positive and negative experience with RCM Virtual Data Rooms. With that information at hand you should be equipped to make an informed buying decision that you won’t regret. What are RCM Virtual Data Rooms pricing details? What integrations are available for RCM Virtual Data Rooms? If you need more information about RCM Virtual Data Rooms or you simply have a question let us know what you need and we’ll forward your request directly to the vendor.